This is a great moment! Michael's and our intern Saskia's paper Towards Zero Waste is ready for cyber space - and for your reading, thinking and acting. 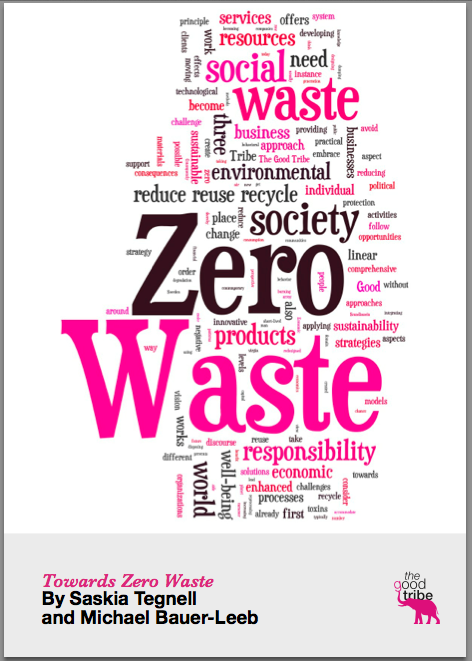 Download Towards Zero Waste here (PDF). The Good Tribe want to contribute to this kind of change. Our vision is to create a Zero Waste society. Looking at nature we find a world without waste, however, contemporary society created by man is anything but zero waste. Therefore we in The Good Tribe work towards this goal by providing knowledge and tools for businesses and organizations to become Zero Waste, both from a material and social point of view. This paper is one step in the process, intended to inform of an approach that we consider powerful enough to introduce change on systemic level. There are many different approaches out there that challenge the linear way in which our society works today. For our purposes we consider Zero Waste to be the most comprehensive and best applicable approach. Zero Waste is more than just a principle. It is a philosophy, an economic model, and practical application. Everybody - every individual, organization, or company - can follow Zero Waste’s simple principle of the three R’s to rethink their consumption patterns and behavior. Zero Waste transcends conventional boundaries by looking at possible solutions for a Zero Waste happy planet from a technological, behavioral, political, and financial perspective. Our activities in The Good Tribe include a broad range of products and services. With regards to Zero Waste we have organized a field trip that brought Brazilian business people and politicians to Scandinavia offering insights to innovative waste management systems; we are running Lindsberg, a meeting venue in Sweden dedicated to Zero Waste operation; and we are developing Zero Waste Apparel and Zero Waste Jam, both practical examples of Zero Waste circular business models. Waste and the effects of our take make waste society affect us all. Hence we all need to take responsibility and work together to develop innovative approaches to resolve present and future challenges. Consequently, The Good Tribe works with different target groups by helping them to embrace their individual responsibilities in tackling the waste problem. It is this comprehensive approach and our ability to think outside the box, which enables us to help our clients to successfully operate in a changing world.